NEW YORK -- Giancarlo Stanton quickly replaced the boos he heard Tuesday night at Yankee Stadium with one loud crack of his bat Wednesday afternoon. About 20 hours after theYankees outfielder was serenaded with jeers following his fifth and final strikeout in his 0 for 5 home debut, he crushed a line-drive home run deep to left field in the first inning of his second game in home pinstripes, a 7-2 Yankees victory over theTampa Bay Rays. He seemed to know the shot off Rays starter Blake Snell was gone right away. 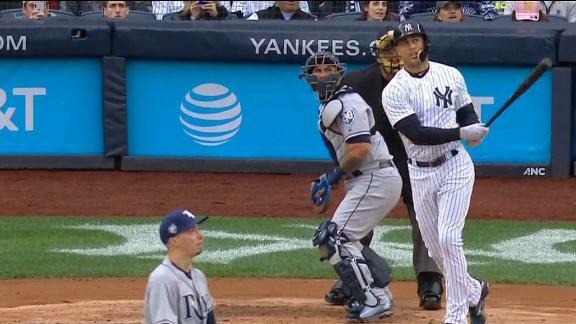 As soon as he made contact, Stanton walked into his trot and forcefully tossed his bat aside with one hand. Instantly, cheers rose through the crowd, and the roar elevated as he rounded the bases. The homer gave the Yankees a 2-1 lead. "He started me off with some changeups, and previously, he threw me some back-foot sliders, so I thought if he was going to leave one out over the plate ... get to it," Stanton said. Stanton was 0-for-3 with a strikeout in his previous at-bats against Snell. Wednesday's home run ball traveled an estimated 458 feet and had an exit velocity of 117.9 mph, according to Statcast. It is the hardest-hit ball of the young major league season, surpassing the previous high (117.3) that was set on Stanton's 426-foot home run on Opening Day at theToronto Blue Jays. Stanton, who led all of baseball with 59 home runs last season as a member of the Miami Marlins, now has three homers this year. His 59th home run last year had an estimated distance of 467 feet. Wednesday's blast was the farthest ball he had hit in a game since then. "When he squares it up," Yankees manager Aaron Boone said, "he really impacts it." After hearing the boos Tuesday, Stanton acknowledged to reporters that he was "awful" and that he had a "bad day." "Didi [Gregorius] picked me up and the rest of the guys. That's what you need on a not-so-good night for an individual," Stanton said of Gregorius' two-homer, eight-RBI performance in Tuesday's 11-4 win against the Rays. Before Wednesday's game, Boone said he was proud of the way Stanton responded to the criticism of his five-strikeout game. "We talk about being accountable all the time, and one thing I've seen from Giancarlo through spring training and now the first days of the season is he's acclimated so well to this team, to our clubhouse," Boone said. "When he, in a sense, chose to come here, he was at a point in his career where it was about winning. "Giancarlo's a smart guy and he didn't just go: 'Ah, I want to be with the Yankees.' There was a lot of thought in what he was doing. He absolutely knows what he signed up for. And again, I'll go back to that it's at a place in his career where it's about winning." Stanton struck out in his next three at-bats Wednesday after hitting the home run. According to Elias, he's the first Yankees player to have struck out eight times across two games. He's now batting .217 (5-for-23) with two doubles, three home runs and 12 strikeouts this season. Much like he did after the five-strikeout outing, Stanton heaped praise Wednesday on his teammates for continuing to propel the Yankees toward another win. "I'm not where I want to be, but you scrape by until you get there," Stanton said. "I was able to put us up early, and the rest of the guys did their job to get us a few more." Giancarlo Stanton crushes Blake Snell's pitch into the left-field bleachers for a 458-foot two-run home run, his first in the Bronx as a member of the Yankees.